i am on Virgin Media VIVID 100 product @ 43/month. I am usually getting 50-70 Mbps speeds depending on the time of the day. As a vodafone mobile customer, they are offering their Superfast 2 product at 25/month !!! so quite a substantial price difference with Virgin. saying they are guaranteeing speed of 55Mbps (so comparable to Virgin speeds...) and average of 63Mbps. any opnion in terms of speed difference between virgin and vodafone etc ? reliability >? saying they are guaranteeing speed of 55Mbps (so comparable to Virgin speeds...) and average of 63Mbps. They guarantee a min sync speed of 55 on the Superfast2 product, but the actual throughput could be lower. I get a solid 18 up all the time though. 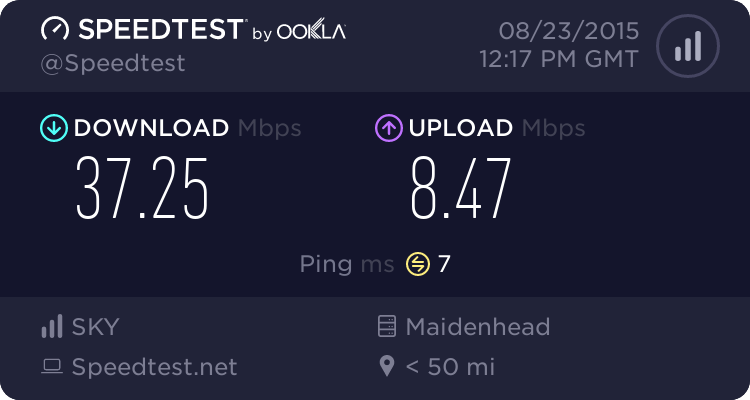 When I switched to VF from SKy it was a terrible experience as the exchange backhaul was running hot, but once that was addressed the service has been ok - speed test fluctuate, but as a general rule it works fine - I work from home 2 days a week so need a stable service. Their supplied router is a bit naff, but they will supply logon details and you can use your own kit. Sorry, I can't recommend them on the Sandy exchange. On the guaranteed 55meg, sync at 48 meg with my own router as the VF one kept dropping the 5ghz wifi. My throughput has not risen above 20 meg, with as low as 7meg for the last 4 days, not just in peak times, even though wired and plugged to master socket.. I am using the 30 day guarantee to leave. I spoke too soon... service has dropped out and the Broadband support offices shut in the evening, so I can't report the fault - no sync on the line (but I still have a dialtone). Checked with my vigor 130 and the vf router, so definitely not my end!